Avena Day Cream which supplies abundant moisture to your skin to keep it plump, supple and elastic. Many of us dream about a healthy and younger looking skin and on that note we would like to introduce to you our fantastic Avena Day Cream which supplies abundant moisture to your skin to keep it plump, supple and elastic. The active ingredients are reputed to pro-actively work to maximise the health of your skin and to fight aging by increasing circulation and stimulating collagen. water to moisturise your skin and a drop of enriching vitamin-e oil. cedarwood essential oil to soothe and harmonise your skin. We are not claiming that using this product will make you look 10 years younger but we are confident to say that Avena Day Cream maintains a firm and youthful looking skin, whilst also ensuring that the elastin in your skin is healthy and protected. The blended ingredients can also help repair damage already caused from neglect, excessive exposure to the sun or the negative effects of previous bad skin care as well as modern day influences, such as being in air-conditioned environments. 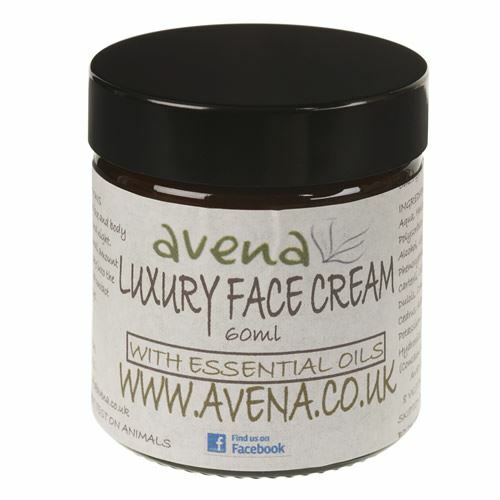 Avena Day Cream contains lovely natural essential oils, it has NO – parabens, artificial colours or animal additives. It has not been tested on animals and we don’t buy ingredients from companies that test on animals or ever have. Ingredients – water (Aqua), sunflower seed oil (Helianthus annuus), Polysorbate 20, cetearyl alcohol, glyceryl stearate, phenoxyethanol, carbomer, potassium sorbate, sodium hydroxide, frankincense essential oil (Boswellia carterii), orange essential oil (Citrus aurantium dulcis), myrrh essential oil (Commiphora myrrha), cedarwood essential oil (Cedrus atlantica) and vitamin-e oil (Tocopherol). Please note that Avena Day Cream does contain nut oils and is for external use only. Please consult your doctor before using products containing essential oils if you are currently suffering from any medical conditions, are pregnant or breastfeeding.